Are you a germaphobe? Or do you feel the urge to pop that bubble wrap whenever it’s nearby? If so, you’ll probably also love watching these E.Coli bacteria burst as they are destroyed by a viral infection. As our experiment uses bacteria, the virus that we will be using is known as a Bacteriophage (and in our case we used a T4 phage), which are a group of viruses that target bacteria. The T4 phages are known to undergo a specific type of replication using the bacterium’s inner mechanisms which results is the lysis of the bacterium, known as the lytic cycle. The lytic cycle highjacks the cell’s replication and translation mechanisms to produce multiple copies of the phage within the cell. 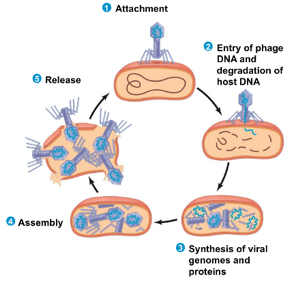 The phage first attaches and injects its genetic information into the host cell, where it utilizes the cells inner mechanisms to replicate and produce the individual phage components. These components are then assembled into final bacteriophages. Once enough of these phages have accumulated, lysozyme (an enzyme produced during the infection) begins to break down the bacterium’s cell wall. Unable to withstand the osmotic pressure, the bacterium bursts and releases the newly formed bacteriophages, allowing them to infect other cells. To view this phenomenon, we prepared a 35mm Ibidi dish with a nutritive LB agar medium with both the bacteria and bacteriophages mixed in. Then, the bacteria were imaged using the live cell imaging microscope from Nanolive – 3D Cell Explorer – at 37°C for 2 hours with images being captured every 30 seconds. *Special thanks to Laboratoire Public L’éprouvette, UNIL for suppyling the samples and collaborating with Nanolive on this project.